This adapter ring provides a 67mm threaded mount for adding telephoto and wide angle lenses or filters to the front of your compatible Canon PowerShot digital camera. Attaches via bayonet mount. This 2.5x Telephoto & .45x Wide-Angle Digital Lens Set extends your wide angle, telephoto and macro capabilities, while maintaining the autofocus and auto exposure operations of your camera. Fits the following filter mounts: 49mm, 52mm, 55mm, 58mm. Works best with standard focal length lenses (such as 18-55mm kit lenses). This 67-58mm Step-Down Adapter Ring easily screws onto the front of any lens with a 67mm filter mount, and allows you to convert to the 58mm threads of accessory items (such as filters, hoods, ring flashes and lens converters). This Vivitar 3-Piece Multi-Coated HD Filter Set contains a variety of multi-coated glass filters that will optimize your photography experience, and protect your lenses from scratches and dust. 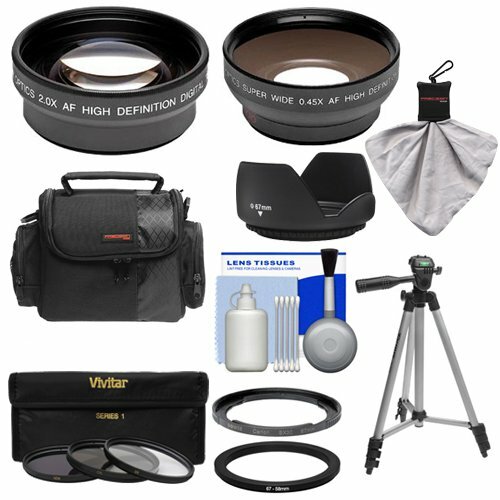 Includes UV (ultraviolet), CPL (circular polarizer), ND8 (neutral density) filters and filter case. This Precision Design 50-inch Compact Tripod is ideal for keeping your camera steady in nearly any location, allowing you to capture crisp, clear, steady images with ease. If you have any questions about this product by Bower, contact us by completing and submitting the form below. If you are looking for a specif part number, please include it with your message. Nikon MH-66 Charger for Nikon EN-EL19 Coolpix S100, S3100, S3200, S3300, S3500, S3600, S3700, S4100, S4200, S4300, S5200, S5300, S6400, S6500, S6800, S6900, S7000 Digital Camera + 2 Bonus Battery! Leica V-LUX (Typ 114) High Grade Multi-Coated, Multi-Threaded, 3 Piece Lens Filter Kit (62mm) Made By Optics + Nw Direct Microfiber Cleaning Cloth.